Join the experts at the Sleeter Group along with accounting and software solution leaders and your peers for a day of education, technology best practices, expert advice, and networking. 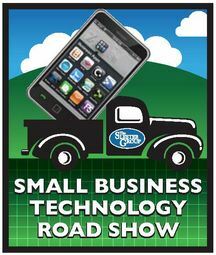 The Small Business Technology Road Show is a showcase of the latest accounting technologies that will highlight a broad range of small business solutions. Learn how your business can grow and profit in the increasingly cloud and mobile world by streamlining business processes and collaborating with your accountant. Now, like never before, accountants and their clients can work together via the Internet to broaden the scope of what you do together, and enhance the accountant/client relationship. At these seminars, both accountants and their clients can learn how to put powerful new solutions to work. Doug Sleeter’s in-depth knowledge of accounting software solutions and his “systems” approach to solving accounting problems for the SMB market have earned him the reputation of being one of the nation’s leading small business accounting software experts. He has been named one of the “Top 100 Most Influential People in Accounting” by Accounting Today magazine and he was recently recognized by The CPA Practice Advisor magazine as one of the accounting profession’s “Top 25 Thought Leaders.” Doug provides expert-level consulting to hundreds of accounting software consultants through the Sleeter Group Consultants Network, a group of highly trained experts. He is the host of The Sleeter Group’s annual Accounting Solutions Conference, bringing together consultants and software developers from across the U.S., Canada, and the Caribbean. Doug is the author of over 40 reference books and courseware materials, and writes a regular column, “Successful Small Business Consulting,” for The CPA Practice Advisor magazine. Randolph P. (Randy) Johnston, MCS has been a top rated speaker in the technology industry for over 30 years. He was inducted into the Accounting Hall of Fame in 2011. He was selected as a Top 25 Thought Leader in Accounting in 2011 and 2012. His influence throughout the accounting industry is highlighted once again this year by being a recipient of the 2011 Accounting Today Top 100 Most Influential People in Accounting award for the eighth consecutive year. Among his many other awards, he also holds the honor of being one of nine Technology Stars in the U.S. by Accounting Technology Magazine. Randy writes a monthly column for The CPA Practice Advisor, articles for the Journal of Accountancy, and creates articles for both accounting and technology publications, as well as being the author of numerous books.